Is Bengaluru the proverbial goose that lays the golden egg? If the political tizzy the city saw last month during BBMP mayor elections is anything to go by, one can confidently say yes! Should the citizens be grateful to all our netas for their public display of enthusiasm to serve the city or be plain worried? Going by BBMP’s history of siphoning off crores of rupees and scams after scams facilitated by the official-politician-contractor nexus, we should be a worried lot. The Kataria Committee Report to probe financial irregularities from 2007-2015 may have been a ploy used by the State Government to dissolve the BBMP. However the report pegs the scam amount at around Rs 4,000 Crore. Amounts of the scams refer to money siphoned off by fraud / cheating, accepting bribes and cutting corners causing loss to the exchequer / revenue loss, earmarked funds diverted or misused and other such corrupt practices. It maybe a painful read, but listed are a few of the infamous BBMP scams in the past decade. A sanction letter with the Commissioner’s signature was tampered by the sectional officers in Accounts department. They changed Rs 30 lakhs to 49 crores in the letter that sanctioned funds for 147 works. One official was arrested while the others went into hiding. Investigating authorities suspect the amount to be larger. SWDs leading to the Koramangala-Challaghatta, Vrushabhavathi and Hebbal Valley received JNNURM funds for remodelling and revival. The money was diverted for works such as renovating the office of the Chief Engineer – SWD. 14.1 acres of government land meant for public amenities in Hosakere Halli area was auctioned for Rs 18 Crore. The land was then converted into non-agriculture, has been issued a khatha and building plans for a 48-storey skyscraper have been sanctioned. The loss to the exchequer was estimated at about Rs 500 Crore. Khathas were issued for 66 acres of land in Rajarajeshwari Nagar without any documentation or collecting betterment charges. Khathas were also issued for land earmarked as parks and hundreds of spare sites totalling to over 10 acres. Owners of properties of roads not demarcated for widening, old roads and properties outside BBMP limits have been issued TDR certificates. Officials in the ring included Joint Commissioners, Executive Engineers, Contractors and Surveyors. 19 officials have been charged with forgery, cheating and tampering with records. Bills were made for work that was not carried out. Bogus vehicle registration numbers were used, some even belonged to two-wheelers. Read more here. 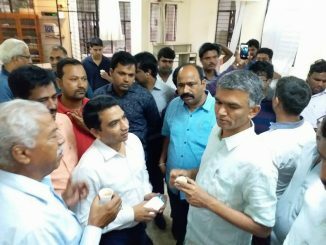 Contractors, officials from BBMP, BWSSB and BDA took up works across city that involved all three agencies and made claims from all agencies for the same bill. In many cases the works were not even carried out. This scam was exposed in Malleshwaram, Gandhinagar and Rajarajeshwarinagar assembly constituencies. The investigation was handed over to BMTF, but the BMTF office that handled the related files caught fire. Right now CID is handling the case. There have been calls for CBI investigation to be done in the other 25 assembly constituencies and estimates of several thousand crores siphoned off in a similar fashion. One update reports that of the 189 works, 67 were probed by the CID, 33 engineers and 31 contractors have been named and of works probed the amount siphoned off was 6 Crs. Another report says that 56 chargesheets were filed against the engineers and contractors in 81 cases. Officials were bribed to overlook revenue-generating 20,000 hoardings across the city. The civic body has decided not to probe the matter and the Assistant Commissioner who brought out the discrepancies earned himself another transfer. There are several other scams and complaints filed with the Lokayukta; installation of solar power systems, fake khatha scam, sapling scam and others. While there are several reports of the scams, it is difficult to find many reports on action taken, prosecution and conviction of those guilty. In some cases enquiries and CID investigations are initiated but no meaningful conclusion or outcome is ever heard of. In many cases, scams have not been pursued. Conviction or arrests are scattered and rare. Even the former Commissioner played down the extent of the scams and refuted several charges including those about financial mismanagement in BBMP. Everyone knows how the tale of goose that laid the golden egg ends, but in the case of our city let us hope that there is a twist somewhere in its tale. If you remember any other scam that happened in last 10 years, do write to us, comment under the article, tag us on twitter or facebook! We will include them in this article. BDA’s 2200 Cr mutual fund scam: Who gets the commission? These ‘scams’ have the full support of the people and the System. No one is really outraged by such news. Not only that, those who loot, are brought back to continue doing the same, what other proof do you need? Only the clueless are shocked. Oh my god!! Now I know why the mayoral election was taken as a question of life and death by all the political parties concerned. This report is really shocking. We, the common people, sweat it out day and night for a few thousands and these corrupt babus and netas fearlessly and shamelessly swindle millions! As any learned citizen, I was aware that BBMP is not corruption free like any govt dept. But the total amount involving these scams is really shocking. True to your name, you are taking up issues concerning common people like me. Thanks for this report.